There is no name or no sign, and no telephone number to contact, though this ramen restaurant has been very popular among ramen manias. 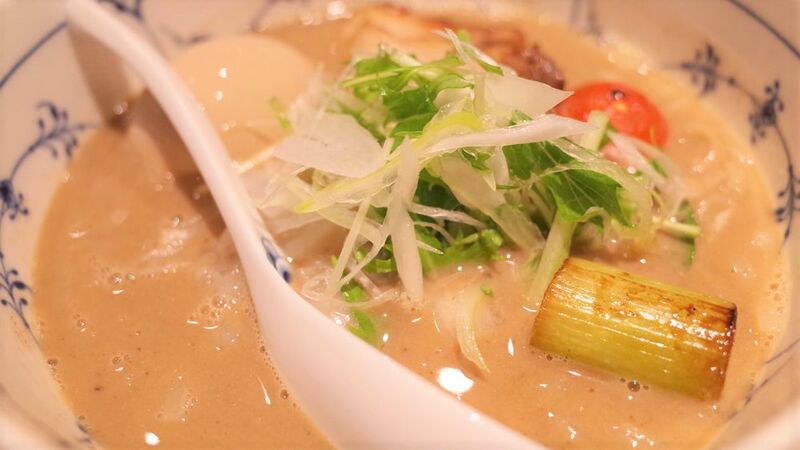 It’s an affiliated restaurant of the well known ramen “Sugariya-Menya-Takakura-Nijo”. ● Can you find the entrance? ● It’s located on B1 floor. The restaurant interior is well decorated as a modern Japanese style with a lovely view of Takasegawa stre. Grilled chicken on top of noodles in a very rich chicken broth with dashi, topped with a mini-tomato and spring onions are very tasty. This hidden restaurant has spreaded big through word of mouth, online reviews. There is often a queue to the restaurant, so you can find the right entrance to taste the ramen. Access : 3-minute walk from Kyoto-shiyakusho-mae station on the subway, 5-minute walk from Sanjo station on the Keihan main line.